Included in the 2010 Webby Award winners and nominees are several categories related to Web design and development. We toured many of these sites and picked a few of our favorites. Not all were winners, but each is a stunning example of how design can be used to educate, promote, entertain and brand. Each of these sites covers a different topic, but they all have a few things in common. When you land on each page you know exactly what to do. You also know the intention of each site and what you can expect when exploring. Each site is true to its mission and highly-targeted to the intended audience. While some of the technologies might not be feasible for all Web professionals, these examples do an excellent job of demonstrating how innovation and a well-planned design can transform a Web visit into a full-blown, interactive experience. The results are more clicks, longer time-on-site, higher exposure and better branding. 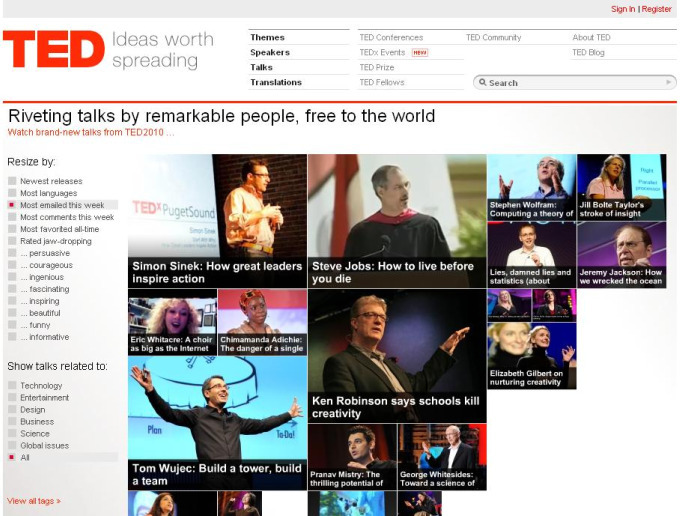 Ted's tagline is "Ideas worth spreading." Their home page is designed in a way that appeals directly to their information-seeking audience. What first stands out is the irregular look of the page -- not something normally seen in design but that demands immediate exploration. Each photo includes a person's face; experts in the topic they discuss. It's an excellent job of establishing immediate credibility. Hover over the image and you get a synopsis of the story. You will also see the number of comments on the story and how many times it has been e-mailed -- fulfilling TED's "Ideas worth spreading" mission. A click-through leads to the expert's video speech on the topic. TED's navigation is also impressive. On the left the site, stories can be organized by newest releases, most languages, most e-mailed this week, rated jaw-dropping and more. Click one of those selections and the screen reorganizes with new photos -- the largest of which are the most relevant to your selection. And, it's all done without reloading the entire page. It's elegant, easy-to-navigate and useful. Michael Jordan not only revolutionized basketball but also the shoe industry, the athlete-as-a-celebrity, Nike itself and more. History of Flight is intriguing because it is not only a beautiful website but also a full branding mission wrapped in an engaging user experience. The Air Jordan Brand is immortalized on this website. Each year's model can be viewed, along with fully-interactive options to learn about that year in Jordan's career, and the Jordan and Nike brand. In the example seen here, we see not only 1998's shoe, but also an option to discover the original Air Jordans along with the story behind them that year (when MJ broke out a pair for what he thought would be his last game in Madison Square Garden, and scored 42 points). Click the clock at top and you are presented with a TV commercial from the period detailing Jordan's life as a businessman and Nike juggernaut. History of Flight is brand curation at its very best. LIFE Magazine has become known for their riveting, sometimes disturbing photography. So, when you hit the home page and see "Today's Top Photos" you feel right at home and you know what to do. Start clicking through the slider and you not only get photos, but a snippet of the story behind the photo. 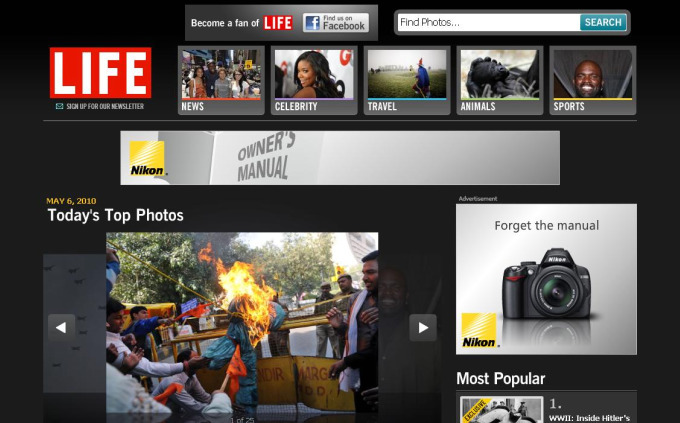 At the top, you can navigate to news, celebrity, travel, animals and sports -- all with accompanying, appropriate photos. LIFE is determined to engage their users and help spread their interests across the Web. To that end, a "Most Popular" sidebar shows the site's most-visited photo galleries. Click on any photo on the site and the option to share it is presented: via e-mail, RSS, Digg, Facebook, Twitter and more. My first thoughts of Wrangler are cowboys, department stores and cheap jeans. But after seeing their Blue Bell Collection website, things have changed. 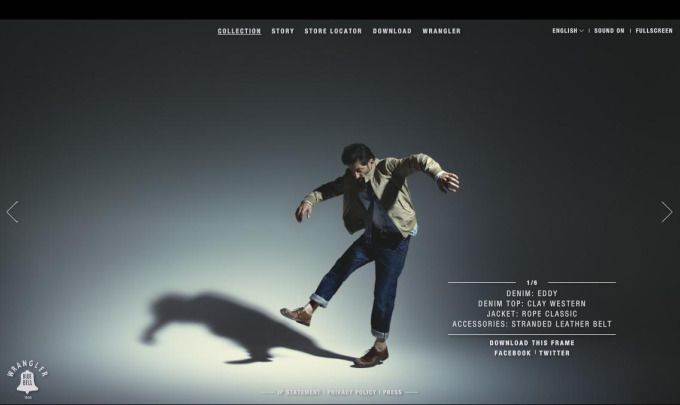 To enter the site and see the collection, you must unzip the man's jacket. Then, you are guided through six stages. In each, you can drag the man all over the screen. He's in different Wrangler gear in each panel. It's immersive and entertaining, but you also get to see the clothes in action, how they move with the man with each swipe of the mouse. This experience alone is far ahead of most other clothing retailers' presentations of their wares and worthy of special attention. What do celebrity seekers want most? Gossip. And how do they identify celebrities? By their glamorous photographs. Wonderwall delivers both. Wonderwall's home page is pieced together using celebrity photographs and short headlines. Hover over a photograph and more detail is revealed about the story. Click the story and you get detailed information along with links to related information and videos. What's most interesting is Wonderwall's use of a horizontal slider. Normally considered not user-friendly, it works here. As you slide across a story, not only can you read more (and get exposed to a well-placed ad) but you also are given the chance to comment with your Facebook account. Continue sliding and you are exposed to more photo-navigation prompts, spawning further exploration. Once a user becomes accustomed to the navigation style, it becomes quite easy to continue clicking.